contraband ivory in more than 30 years, amid surging illegal wildlife seizures fuelled by lax regulations and buoyant demand from mainland China. The former British colony situated at the mouth of China’s Pearl River Delta is one of the world’s top global transit hubs for endangered species and their products, such as shark fin, pangolin skin and rosewood furniture. 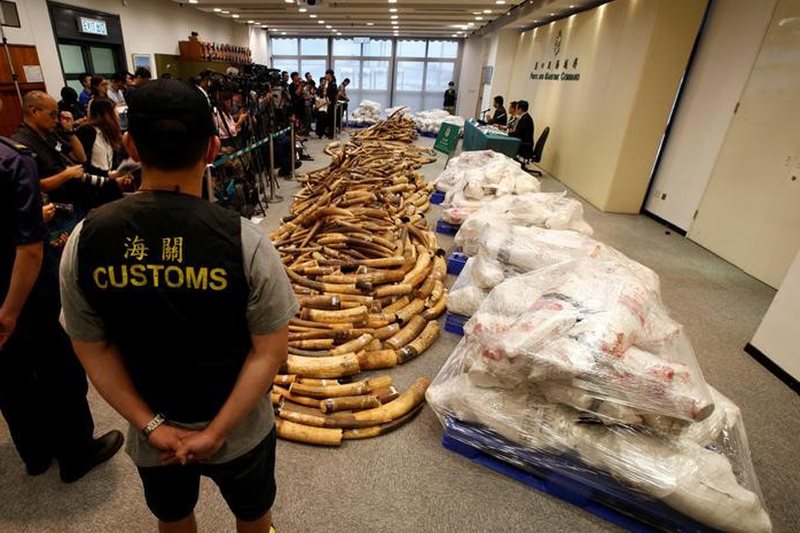 Customs officials on Thursday said they had seized 7,200 kg (15,873 lb) of ivory tusks, valued at around HK$72 million ($9.22 million), at a cargo warehouse beside the city’s harbour. The ivory was discovered in a 40-foot container from Malaysia declared to hold frozen fish, beneath which officers found the tusks. “The 1,000 boxes were half-empty when we found them with frozen fish put around the ivory,” said customs official Raymond Chan. Conservation group WildAid estimated the tusks had probably been taken from about 720 elephants. Hong Kong’s agriculture, fisheries and conservation department said it was investigating the shipment’s final destination, probably a nearby country. A special administrative region of China, Hong Kong has lagged other places, including the mainland, in adopting tighter rules against trading of ivory and other endangered species. Regulatory loopholes allow traders to use a stockpile of legal ivory as cover to smuggle illegal ivory to unsuspecting buyers, say groups such as the World Wildlife Fund and WildAid. China, Singapore and the United States have all banned the ivory trade, with the mainland closing down all operations by the end of this year. Hong Kong, however, has only timetabled a ban by 2021. Legislators are set to discuss the issue on Friday and decide if traders should be compensated in the case of a total ban. The teeming port city has the largest retail market for ivory, with 90 percent of consumers from the mainland. Hong Kong has been trading ivory for more than 150 years, fashioned into jewelry and sculptures, but activists say illegal poaching is pushing elephants towards extinction. The independent Environmental Investigation Agency last week identified Shuidong, a southern Chinese coastal town close to Hong Kong, as the hub for 10 to 20 Chinese-led criminal syndicates bringing in ivory from Africa. African rangers detailed harrowing firsthand tales of elephant poaching during a June visit to Hong Kong, an event marked by a tense standoff with traders who say their business is legal.